A commercial interior office fit-out, with a central blue feature which “snakes” its way through the space in order to break up the large expanse of open plan office space. The ‘snake’ creates a communal zone of informal meeting, print, storage and water cooler areas where people will naturally come together over the course of a working day. 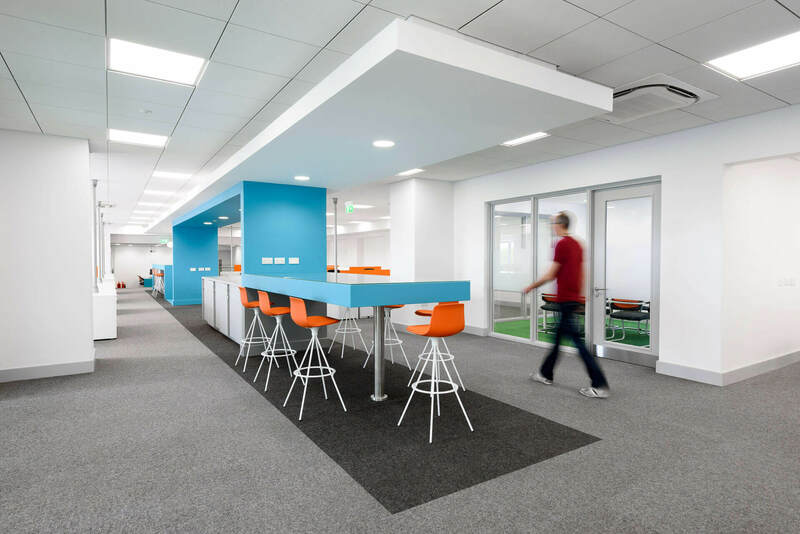 As the Project Managers and the Lead Architect, O’Leary Sludds Architects offered a turnkey service which ranged from the co-ordination of a full design team to procuring all loose & fitted furniture. 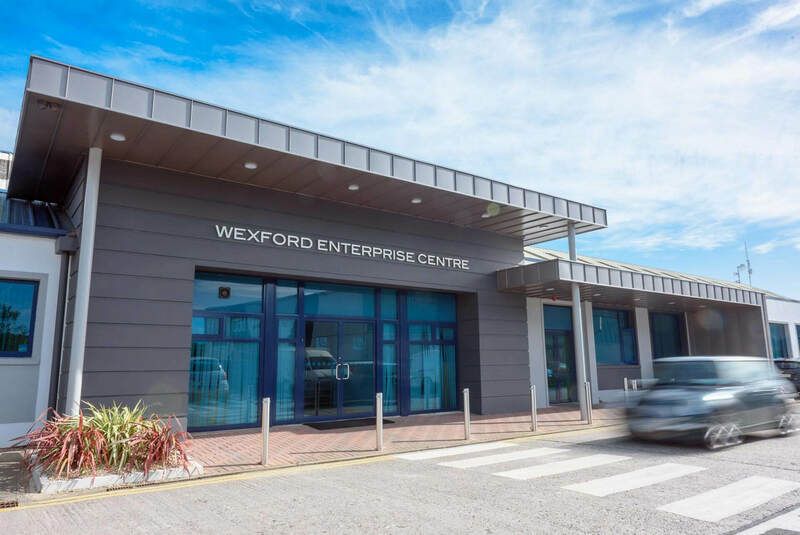 Enhancing the visual impact of the main entrance to the enterprise centre with a cantilevered zinc canopy over the main entrance with a second lower canopy, located adjacent to the main canopy to form a bicycle shelter, was our main objective for the centre. The juxtaposition of the overlapping canopies and zinc wall is what makes the design a success and creates the visual impact required to fulfil our client’s brief. 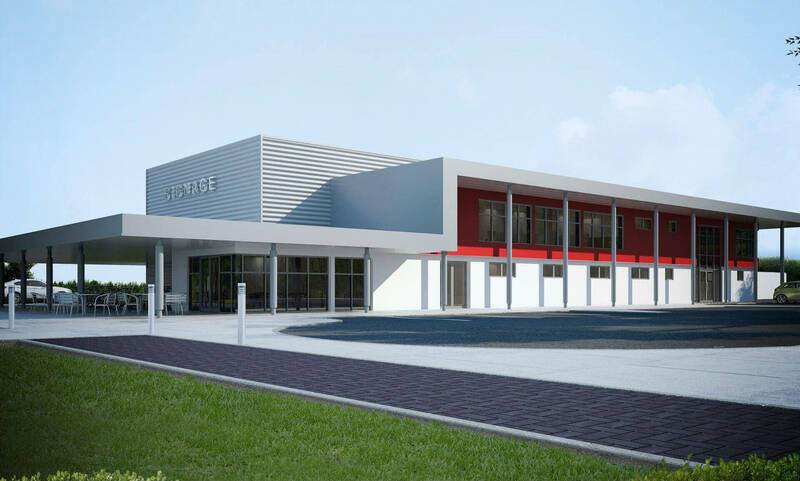 The design for this light industrial warehouse development consists of three elements; the large double height warehouse to the rear, offices and meeting rooms to the first floor of the front red section, and ancillary uses, such as staff locker rooms, underneath. The canopy and colonnade over the front section of the building is the unifying element of the design and helps bring the various elements together “under one roof.” The canopy becomes single storey in height over the external bicycle shelter and canteen area. You've reached the end of projects listed within this category!